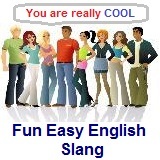 ﻿ Fun Easy English - new classroom free online classes english language lessons speaking listening writing reading september 9. Today in the classroom you are going to learn some slang beginning with the letter P.
Today learn slang beginning with the letter P.
If someone calls you a party animal it might not be a compliment. A party animal is someone who loves to go to and be crazy at parties. This is a positive meaning for other people who like parties and a negative meaning for those who do not like to go to parties.